But when it comes to weirdo Madballs knockoffs, that's just scratching the surface. This is a post to showcase a handful of other related oddities I've come across. 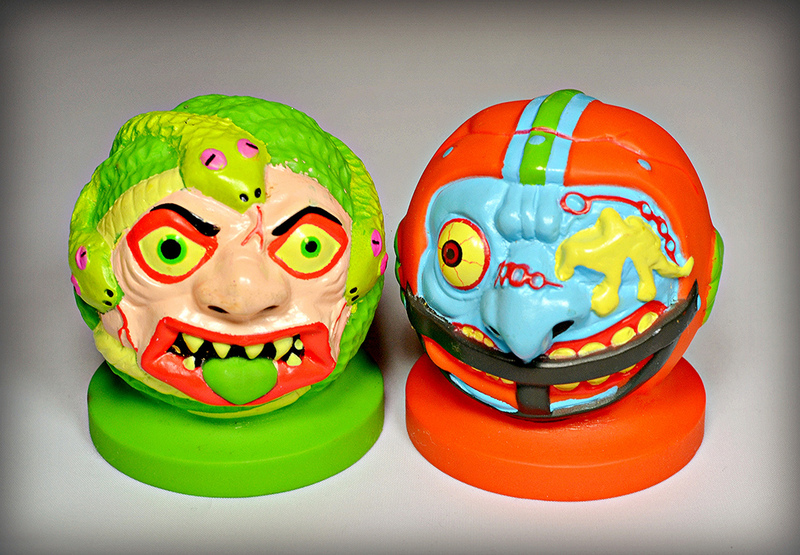 The first examples, pictured at the top of the post, are about the same size as standard Madballs. They even rip off actual Madballs characters--specifically Aargh (blue guy) and Skull Face (pink guy). They differ in that they're made of rubber instead of foam and are hollow inside. I've had these pretty much as long as I can remember, but can't recall exactly where I got them as a kid or if they were sold under a specific name. Here we have some football-shaped knockoffs. I'm pretty sure the blue one comes from the same group as the ones in the photo at the top of the post. It's at least made out of the same material. The one with the worms crawling out of its eye is from a set that definitely has a name--Weird Balls by the Mel Appel company. This one is called Worm Skull. You can see a packaged example, and other balls from the line, here. These things are still somewhat of a mystery to me, even though I can tell you exactly where I got them. They were being given out as game prizes at a local carnival sometime in the mid-1990s. They're made of hard plastic and look like they're supposed to sit on top something, but I don't know what. They're slightly smaller than an actual Madball, but not by much. 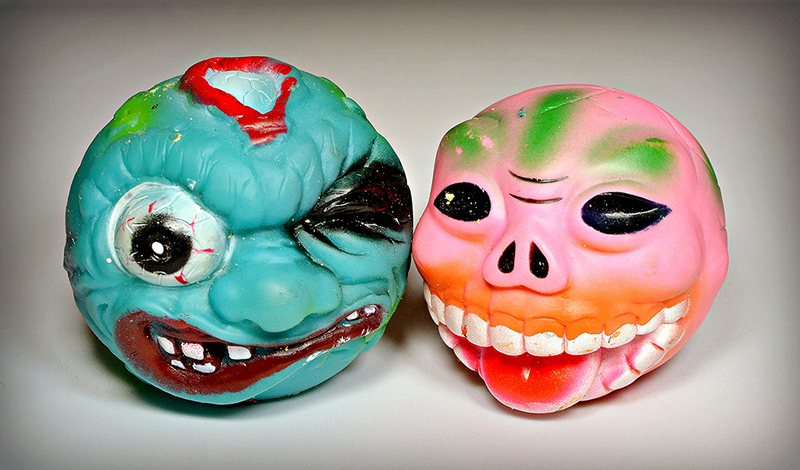 They're modeled after actual Madballs character, with the names (Snake Bait and Freaky Fullback) marked on their bases, so I wonder if they're official Madballs products. Has anyone else ever seen these? Next up we have these mini pink weirdos, which are some of my favorite knockoffs. 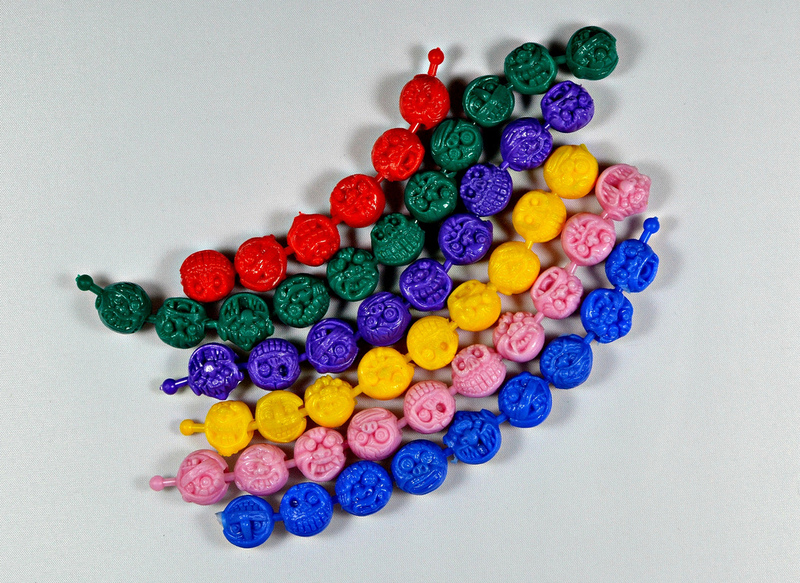 They're about the size of a superball, are made of a hollow soft plastic and have a hole on the bottom so they can be used as pencil toppers. I actually think they might have been sold on top of pencils. I got these sometime in the '90s, but I can't remember how many different sculpts there were or anything else about them. Here's one that came attached to a clear container that was shaped like a body and filled with tiny crunchy fruity candies. I remember getting it at a mall candy store in the late-'80s or very early '90s. I also remember there being additional characters. I wish I still had the body, but I think it got damaged at some point over the years and got thrown out. Damn. Finally, what says "grotesque monsters" more than brightly-colored plastic pop beads? I think this is proof right here that everything was made into a Madballs knockoff. I got these off eBay a couple years ago, so I'm not sure exactly when they originated or how they were first sold. There you have it. 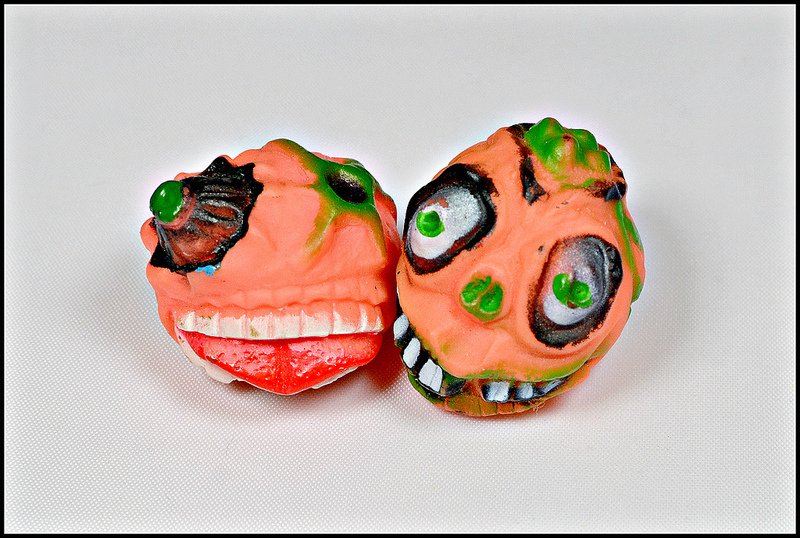 While there are undoubtedly plenty more Madballs knockoffs in the world to blog about, that will do it for now. I'm sure I'll have more to post at some point. What about you? 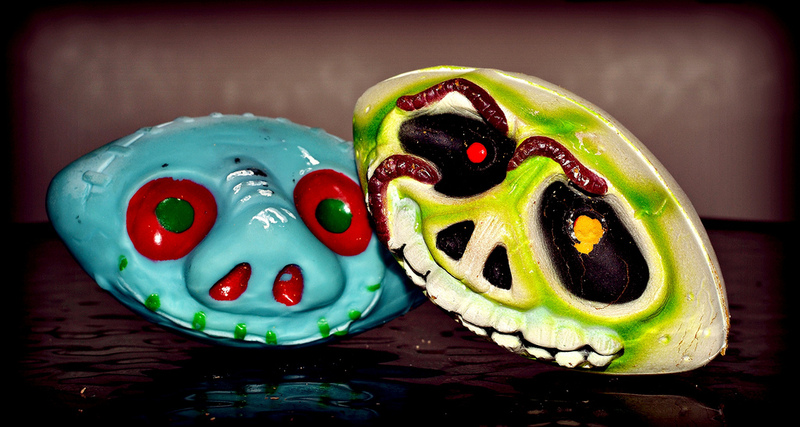 Do you own any strange Madballs imitations? You have some of the coolest Madball knockoffs I've ever seen! I don't know how, but I missed the Madball boat as a kid. I didn't have a single Madball! My favorite of the bunch are those footballs of yours. Pretty sweet. I always keep an eye out (no pun intended) for Madballesque items, so if I come across anything on my DI adventures I'll send 'em your way and add to the ball pit. Thanks! Almost all these are saved from when I was a kid. Those only ones that aren't are the pop-beads. I loved Madballs back then, but interestingly I had way more knockoffs than actual Madballs. The Madball head things are off the silly string cans they made. They're the caps. *The actual stuff was called Freaky String. There was also a Swine Sucker. Not sure if there was any others. The white football with the worms is a Mel Appel Weird Ball, named Worm Skull. The other is a knock off of that, which is probably worth a decent chunk of cash. 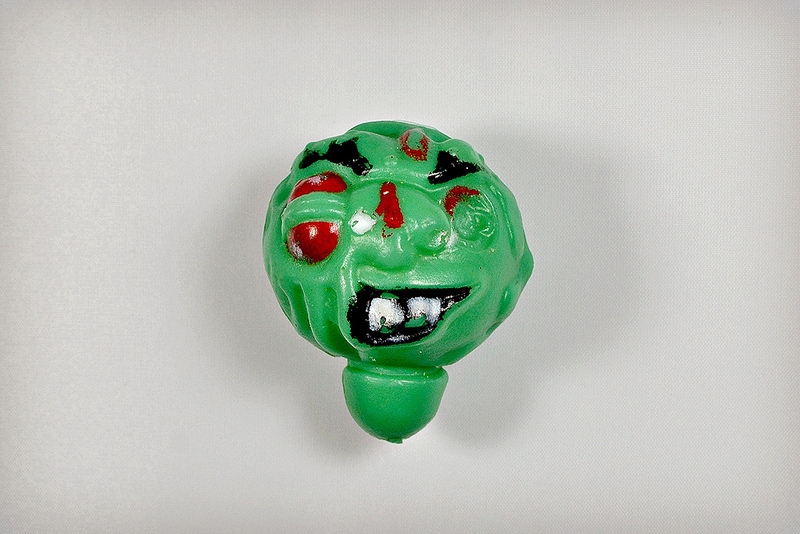 I have a madballs knockoff by Russ, do you know what it was called? I'm not sure offhand what they might be without seeing a pic. Feel free to send over photos if you have them.